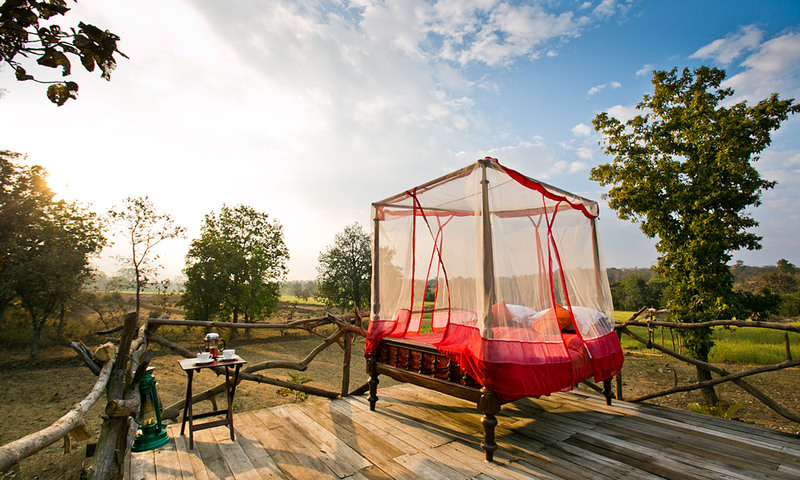 Sleep amid prowling wildlife in rural India at Jamatra Wilderness Camp. Pitched right by a forest, this luxury glamping lodge gives guests the chance to get up close to nature with its array of shut-eye options. Sink into bed in one of 10 luxury tents, snuggle up on your private patio with a hot water bottle to keep you cosy or, best of all, snooze in an alfresco suite. Set on a platform high on stilts, these four-poster beds, known as machaan, offer guests unbeatable star-gazing opportunities under a clear night sky and prime animal viewing come the crack of dawn. Spot deer, leopards and, if you’re lucky, tigers roaming from nearby Pench National Park. After a night out in nature enjoy breakfast back at camp, a daytime safari and afternoon cocktails in the shade of a huge banyan tree. The nearest airport and railway station is in Nagpur, about 88 kilometres away from the camp. The Jungle Plan, an all-inclusive jungle safari experience, starts at US$565 for two people. Alternatively, the America Plan includes accommodation and meals for two from US$300 per night. Most of the revenue from a night on a machaan is given back to the local farmers.